At the southernmost extremity of Black Marsh, the region informally known as Murkmire gradually slopes down from the interior uplands of the north until it fades into the ocean. Legend holds that the land once extended much further south before it sank beneath the waves. 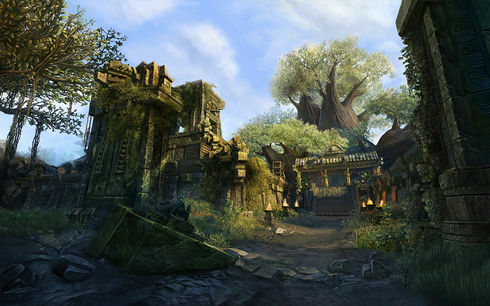 Sunken Treasure: Join the Cyrodilic Collections' expedition to an ancient xanmeer in Murkmire. Missing in Murkmire: Help Famia Mercius find missing expedition members. Whispers in the Wood: Work with the local tribes to find out more about a mysterious Argonian relic. Death and Dreaming: Join a dream-wallow ritual and learn the truth about the Remnant of Argon. The Swamp and the Serpent: Pursue a traitor through Deepmire. The Remnant of Argon: a magical refuge hidden inside a powerful Argonian relic. Before a waterfall south of the Dominus Fatum. At the top of the waterfall south of The Dominus Fatum (map) You'll need to drop down from above to reach it. you'll need to enter the interior to reach it. This page was last modified on 3 February 2019, at 03:54.